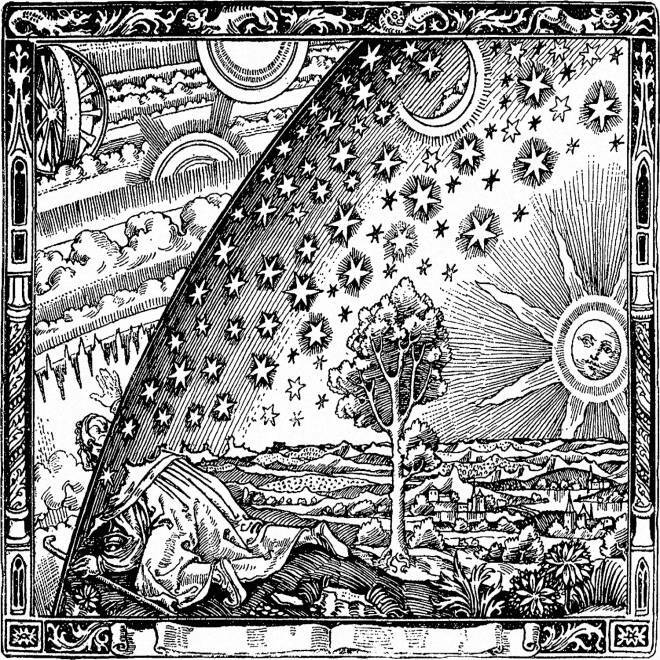 A seeker of truth breaks through the vault of the heavens to discover a metaphysical realm in an engraving from Camille Flammarion's 1888 book "The Atmosphere: Popular Meteorology." Religious holidays such as Easter and Passover usually spark a spate of stories about the intersection of science and religion, and that's especially the case during this presidential election year. Some folks seem to assume that the scientific and spiritual ways of looking at the world are fundamentally at odds, but a new poll commissioned by ScienceDebate.org suggests that scientific issues are hugely important to religious believers as well as non-believers. The online survey of 1,005 likely U.S. voters, conducted last month by JZ Analytics, found that 84 percent of the respondents ranked policy issues relating to science, innovation and health as important themes for presidential debates. That puts the science agenda right behind economic policy and national security policy, and ahead of environmental policy and faith and values. The added twist is that science was ranked in the same order by the survey's Christian subgroups. Eighty-two percent of Catholics and 83 percent of Protestants saw science issues as important, while 49 percent and 59 percent of those respective groupings thought the candidates' views on faith and values were important to debate. "Even though we often hear of faith opposing science in the political arena, these findings show that the perception isn't necessarily true," Shawn Lawrence Otto, co-founder of ScienceDebate.org, said in a news release about the study. For Otto and his colleagues, the bottom line is that science policy views should take precedence over the candidates' religious beliefs in the political debates to come. But the findings also suggest that there's plenty of room for dialogue between science-minded and spirituallly minded thinkers. You don't need a public opinion survey to figure that out — just look at the dozens upon dozens of books that address questions of science and religion. "Born Believers: The Science of Children's Religious Belief," by Justin Barrett. One of the common views about religious formation is that kids are merely taught to believe what their parents believe. Barrett, a psychologist and anthropologist who's associated with the Fuller Seminary, takes another tack, citing research that suggests children have an innate inclination toward the "God idea." Based on those findings, Barrett comes up with checklists for becoming a confident atheist (step 2 is "do not have children") as well as for encouraging a child's religious development. "Free Will," by Sam Harris. The well-known atheist addresses the well-known paradox of free will vs. determinism in this slim 96-page paperback. Harris cuts through quantum claptrap to argue that free will is an illusion, but he also argues that causes and consequences, intentions and actions provide a basis for morality. "God and the Folly of Faith: The Incompatibility of Science and Religion," by Victor Stenger. This latest volume from philosopher-physicist Victor Stenger argues that Christianity held back the progress of science for a millennium, and that the current perspectives provided by science and religion on the origins of the universe, complexity and consciousness are incompatible. Stenger also decries the negative influence of organized religion on global issues such as overpopulation and environmental degradation. "The Spiritual Doorway in the Brain: A Neurologist's Search for the God Experience," by Kevin Nelson. Near-death experiences, out-of-body sensations, battles with the devil, religious ecstasy and psychotropic drugs all figure in this exploration of the neurological basis for altered states. I like the fact that Nelson doesn't pass judgment: "No matter if we could know how every single brain molecule makes spiritual experience, why the brain is spiritual will remain for many of us our most treasured mystery," he writes. "There is room in the brain for faith." "Where the Conflict Really Lies: Science, Religion and Naturalism," by Alvin Plantinga. This book is something of a counterweight to Stenger's book, arguing that the seeming conflicts between science and religion are due to the scientific method's, um, methodology. Notre Dame philosophy professor Alvin Plantinga puts a lot of weight on the seemingly "fine-tuned" nature of the universe, which is definitely open to debate. And speaking of debate, there's an earlier book on this topic, titled "Science and Religion: Are They Compatible," which features a back-and-forth between Plantinga and atheist philosopher Daniel Dennett. "Why Religion is Natural and Science Is Not," by Robert McCauley. This book draws upon findings in cognitive science and evolutionary biology to make the case that the human brain is naturally more suited to religious belief than to scientific inquiry. McCauley's conclusion is that the scientific perspective poses no real threat to religion, "while the unnaturalness of science puts it in a surprisingly precarious position."